42 руб. 166 шт. 5 дней 1 шт. 15 шт. 71 руб. 1784 шт. 2-3 недели 1 шт. 1 шт. 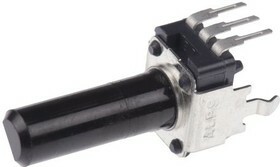 Brought to you by Alps, the RK09K and RK09D series of potentiometers features convenient snap in mounting and an insulated shaft. These compact type potentiometers are ideal for designing high density sets, and are available in a vertical or horizontal mounting direction. The RK09K and RK09D series are commonly used in audio applications. For vertical type Shaft Length shown in heading is measured from the PCB surface to the tip of the shaft, for horizontal type Shaft Length is measured from the mounting tag to the end of the shaft, see datasheet for dimensions.